Categories: MCCSC Sub Teachers Unite! Pay for substitute teachers is up for review at Monroe County Community School Corp.
MCCSC has a pool of 260 substitute teachers and uses an average of about 75 per day, according to Peggy Chambers, MCCSC assistant superintendent for human resources. The district pays $60 a day for noncertified teachers, $70 a day for certified teachers and $80 a day for retired MCCSC teachers. After discussion initiated by MCCSC subs, Chambers said the district decided to take a closer look at the issue. Additionally, the district takes an annual look at all support staff salary and benefit packages this time of year to coincide with the expiration of unionized support staff’s contracts, she said. Unionized support staff includes bus drivers and monitors, custodians and food service employees. Nonunionized staff includes a number of groups, including substitute teachers, teacher aides, secretaries and coordinators, security guards and custodial supervisors. One substitute teacher who has been vocal about a pay increase is David Wierhake, who is also a former MCCSC employee. Wierhake has addressed the school board a number of times asking for an increase in pay, particularly after the district made school days longer but did not increase substitute teachers’ pay. “Essentially substitute teachers this year have taken a 15 percent pay cut,” Wierhake told the board. Wierhake is asking the board to increase sub pay to the national average of $105 a day. Chambers said the district’s pay rate is in line with similar districts. “We feel what we are offering our substitutes is comparable to what’s being offered to substitutes in the area,” she said. Richland-Bean Blossom Community School Corp. pays $65 for subs with an associate’s degree and $80 for those with a bachelor’s degree/teacher license. Martinsville School District pays $64 for certified teachers and $60-$62 for noncertified; Eastern Greene Schools pays $60 for certified and $55 for noncertified; and Lafayette School Corp. pays a flat rate of $65 a day. Indianapolis Public Schools has one of the highest pay rates at $125 for certified teachers; $75-$100 for noncertified and $150 for retired IPS teachers. Chambers plans to make a recommendation to the board early next year. Remarks delivered by David Wierhake to the MCCSC School Board and Administration on Tuesday, December 13, 2011. I would like to thank the Board and Superintendent DeMuth for granting me the time to speak out on behalf of all MCCSC substitute teachers. He went on to say that of the many special obligations incumbent upon an educated citizen, he would include one’s obligation to the pursuit of learning and the obligation to serve the public; to assist at every level of government the improvement of education for all Americans, from grade school to graduate school. There are those who ask me—David Wierhake, when will you be satisfied? I can never be satisfied as long as the leadership of this corporation fails to embrace this very important issue. 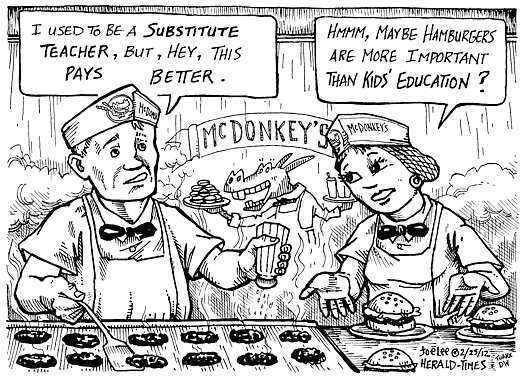 I can never be satisfied as long as a MCCSC substitute teacher is compensated less than a MCCSC school crossing guard. I cannot be satisfied as long as the administration puts more emphasis on material resources than human resources. No, no, I am not satisfied and I will not be satisfied until the substitute teacher in this progressive community is rewarded adequately to the tune of $105/day (which is the national average) and treated with respect for the professional they are. I encourage the school board and administration to do the right thing. And, all I want for Christmas is an increase in the sub teachers pay rate that approaches the national average of $105/day in 2012. I stand before you this evening with this red accordion in hand and my substitute teacher ‘Red Badge of Courage’ for no other reason than to make a point. I look out and in front of me I see the members of our school board, all elected by the community with the exception of Mr. Klein who failed to gain enough votes to serve on two occasions but who some how miraculously found his way into the boardroom by appointment. But I know Mr. Klein and the entire board take their jobs very seriously. But like the insides of this accordion, which by the way I on occasion take into the classroom, I cannot look into each one of your hearts to examine your moral and ethical makeup. And like an accordion, each one of you is different—different backgrounds, values, ‘tone and manner’ if you will. The past three days I’ve filled in at Tri-North as a remediation aide, which is ‘housed’ in the ISD room. At most there are three students each period. They are not in trouble they just desire extra one-on-one assistance. Yet, I heard, “I don’t have anything to do.” When on any sub assignment I bring in books that I feel might interest students. My suggestions sometimes fall flat. I was moved after the first day to put up the sign: YOU CAN LEAD A PERSON TO KNOWLEDGE, BUT YOU CAN’T MAKE THEM THINK. This bit of wisdom caused me to ponder yet another sign: YOU CAN ELECT SOMEONE TO A POSITION OF POWER, BUT YOU CAN’T MAKE THEM LEAD. Everyone knows why I’m here. I’m speaking out on behalf of not only substitute teachers, but also all support staff members regarding fair and equitable compensation in light of the new extended school day. School board president Jim Muehling said recently, “Data is critical.” In truth, ‘data’ is just data and can be manipulated to one’s own end. What is critical to making wise decisions is accurate, unbiased, and unfiltered information. This past academic year sub teachers averaged $9.60/hr ($60/day 6.5-hour day). This year it’s $7.65/hr ($60/day 7.75-hour day). It’s interesting that Muehling was shaken by my suggestion of increasing sub pay rates to allow for the additional hour e.g. another $9-plus added to the day rate saying, “Suggesting the feasibility of a 15.4% increase is ludicrous in the mildest of descriptions…” Would Mr. Muehling—or the entire Board as Ms. Jeanette Butler is on record saying that Mr. Muehling is the official spokesperson and she would not comment further on this issue—characterize an almost 20% pay cut to sub teachers as “Ludicrous in the mildest of descriptions?” I certainly would. I can imagine that Mr. Muehling would consider no additional pay to sub teachers for that extra hour of work as ‘business as usual’ or the ‘law of supply and demand’. FACT: Crossing guards made $15.68/hr in 2008. (What they are making in 2011-12 I know not, but I doubt they saw a 20% pay cut to their hourly rate.) Risking ‘life and limb’ entering into a 4-way stop with a hand-held STOP sign has its price, but twice the sub teacher hourly rate? Are said guards required to have 60 hours of college credit to oversee the safety of our walking-friendly children? “Top of the morning!” to this street-savvy group who now rise a bit earlier to earn their keep. No doubt the MCCSC ‘leadership’ has certain priorities regarding the compensation packages they sign off on. On August 12th I met with new Superintendent Dr. DeMuth (Peggy Chambers of HR in attendance) regarding substitute teacher pay rates. She continued the same mantra as Mr. Muehling stating that the law of supply and demand rules and that the school corporation could get IU students for “free”. Everything is set, she said until January 2012, and then the administration would review this and other issues facing MCCSC. Then she waved multi-sheet document under my nose what she called a ‘study’ of sub teachers pay rates from surrounding communities. (She also referred to my ongoing email citizen comments as “barrages” and suggested that I had no power to ‘work with the school board’. (I had to enlighten her to the fact that the community elects school board members, and as such, I have all the power in the world to speak out as a citizen of both this community and the USA.) When I requested a copy of the report I was given this single sheet. As you can see this is nothing but a list of sub teacher pay rates corporation by corporation with no reference to school hours or length of day. I would like to request that the Board take on an actual and factual study comparing not only neighboring school corporations regarding substitute teacher pay rates, but also other communities within the US that play home to universities or colleges. I have engaged in some research to augment the list that sub coordinator Patti Sparks supplied Dr. DeMuth and Ms. Chambers and would be more than willing to share this information or data. And the issue regarding fair and equitable pay for substitute teachers within MCCSC sincerely matters to me. Ahhh, the first day of school—for a MCCSC substitute teacher! In the words of school board president Jim Muehling, “Data is critical.” Of course, we all know that ‘data’ is just data and can be manipulated to one’s own end. What is important is accurate, unbiased, and unfiltered information. Here are some hard numbers to contemplate regarding the financial reality of the extended school day re: sub teachers. Last year a sub teacher with MCCSC worked for the average rate of $9.60/hr ($60/day for a 6.5 hour day). This year—WITHOUT ANY PAY ADJUSTMENT—our subs will work for the average hourly rate of $7.65 ($60/day for the almost 8 hour day). This equates to a 20% PAY CUT. It’s most interesting that Muehling was shaken by my suggestion of increasing sub teacher day rates to allow for the additional hour e.g. another $9-10 added to the $60/$70 rate structure, “Suggesting the feasibility of a 15.4% increase is ludicrous in the mildest of descriptions…”, when on the flip side of this equation the “educated and talented substitute pool” (Muehling’s words) is now taking a 20% PAY CUT. “Ludicrous in the mildest of descriptions” to quote the Board’s leadership who doesn’t mince words. Well said. Note that the more folks that are unemployed the more who are available for “substitute” work. Consider too what the role of a substitute is conceived to be: adult supervision. What more? If so, subs would not be itinerant workers who are in effect only valuable as a “responsible” party, they would be eligible for a “living wage”; however, there would be no available jobs for other itinerant laborers. We get what we pay for: good substitute teachers are valuable, and it sounds like the school board representatives disrespected them here. —Mike B. You make a good point re: IF THEY FOLLOW PLANS left by teachers. I personally do my best to follow the plans supplied by teachers. And, there is a bit of ‘improvisation’ involved in the execution/delivery of ANY plan. And, there are times when the plans left by a teacher are so scattered and incoherent that you must marvel how creative a sub teacher must be to ‘enlighten and inspire’ a classroom of strangers without a ‘script’ to follow. I think we are on the same page and must lobby the wisest of the wise on our school board to include sub teachers (who also provide “steady and vital work to each of our schools”) as viable part of the MCCSC support staff and move forward with wage increases for ALL support staff—secretaries, health aides, culinary bandits, custodians, and, yes, SUBSTITUTE TEACHERS. Since we are talking about “low paid staff”, have you read NICKELED AND DIMED: ON (NOT) GETTING BY IN AMERICA. Required reading for any certified teacher or the MCCSC school board and administration. Not just forgotten, ignored & looked down upon. —Mike B.